1 - Roughly 70% of Rainy Lake lies in Ontario, Canada and 30% in Minnesota, United States. 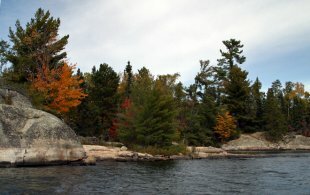 2 - Excluding the Great Lakes, Rainy Lake is the 5th largest inland lake in Ontario. Rainy Lake covers 92, 100 ha (227, 604 acres) and has over 2, 200 islands of which over 2, 000 are in Canada. Some of the main ones are Little American Island, Campfire Island, Dryweed Island, Big Island and Surveyor's Island. 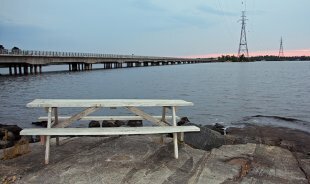 3 - The Noden Causeway crosses Rainy Lake to connect Fort Frances with eastern communities such as Atikokan and Thunder Bay. The causeway was officially opened in 1965 and is comprised of three sections a the first totaling 2, 000 feet, the second at 1, 800 feet and the third at 450 feet. 4 - Rainy Lake is roughly shaped like an "L". The vertical part of the L runs north-south and is called the North Arm. The horizontal part runs south-east and is referred to as the South Arm. There is also Red Gut Bay which juts out from the center of the L.
5 - The lake is divided into three geographically distinct areas; the North Arm, Red Gut Bay and the South Arm. The South Arm has dark stained water similar to the colour of tea and the North Arm has much clearer water. Even though it is a larger, more open body of water, the tea-stained water in the South Arm, actually warms up faster than the North Arm and the fish spawn earlier as a result. Each area has different fishing opportunities. 6 - There is a mermaid statue out on the lake. 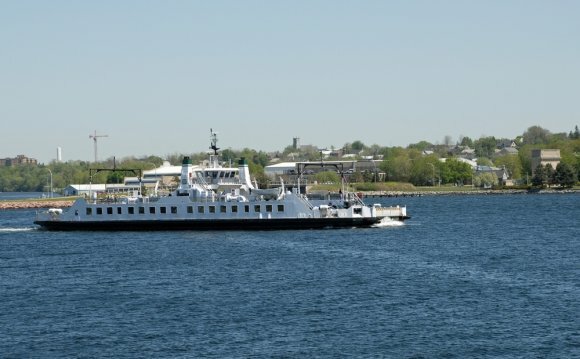 Only accessible by boat, the mermaid which was built in the 1930s, is located in Silver Island Narrows, near Copenhagen Island. National Geographic lists it in their Heart of the Continent Points of Interest. 7 - Plus, the Rainy Lake Watershed's rocks are from 2.5 to 3.6 billion years old. 8 - It was first established in 1688 by Jacques de Noyen and has been settled continuously since 1731. 9 - Rainy Lake's major inlets are Namakan Lake, Kabetogama Lake and via the Seine River and its outflow is the Rainy River where it is harnessed to make hydroelectricity for both Canada and the United States locations. 10 - The CANPASS RABC program facilitates the border clearance process for individuals wishing to cross the border into Canada in remote areas. If you are fishing Rainy Lake in the United States, you can cross into the Canadian waters using this pass. You must abide by Canadian rules and Ontario fishing regulations. Rainy Lake extends 285 km east to west & 100 km north to south at its widest point.